Smart Hooks will keep your diaper bag handy and off of dirty floors. 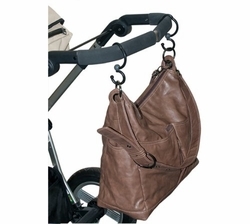 Use Smart Hooks on your stroller, shopping cart or use it to hold your diaper bag above dirty floor areas. (i.e. on the edge of a table top or hang on a door in public restroom areas). BAG NOT INCLUDED. Holds diaper bags, shopping totes, camera bags, handbags and lots more!